For a few days in July, Charlie I'Anson dared to dream. The only Englishman playing in La Liga had been waiting all summer for the fixtures for the new season to be published and now they were out. Elche's reward for safely negotiating their first season back in Spain's top flight since 1988-89 was an opening-day trip to the Nou Camp to face Barcelona this Sunday. For a 21-year-old born in Luton, who started his professional career at non-League Grimsby Town, it was fantasy football. Three years ago he was starting the campaign in the Conference Premier, the fifth tier of English football, lining up in the centre of the Mariners' defence against Fleetwood. Ex-Barnsley goalkeeper Luke Steele - Panathinaikos (Greece). Former West Brom youth goalkeeper Matt Jones - Belenenses (Portugal). Ex-Millwall youth player Kenny Pavey - AIK Stockholm (Sweden). Former Watford left-back Jordan Stewart - San Jose Earthquakes (USA). Ex-Man City forward Bradley Wright-Phillips - New York Red Bulls (USA). Now the plasterer's son, promoted to Elche's first-team squad after a string of impressive displays while captaining the reserves last season, was wondering how he could stop Lionel Messi or Neymar. Then came the hammer blow. Two weeks after the fixtures were released, I'Anson - who made two La Liga starts and a further four appearances on the substitutes' bench last season - was offered the chance to spend the 2014-15 season on loan at Alcorcon, on the outskirts of Madrid, in the Segunda Division, Spain's second tier. Seen as a future first-team regular at Elche, a club just down the road from Alicante on the Mediterranean coast with a core of 25,000 supporters, I'Anson has been sent out to gain more experience. So no immediate outing at the Nou Camp, no rubbing shoulders with Barcelona's galaxy of stars. For the time being, the closest the former Nottingham Forest trialist will get to facing Messi will be on his PlayStation. Laurie Cunningham (Real Madrid & Sporting Gijon, 1979-82, 1983-84), Peter Barnes (Real Betis, 1982-83), Gary Lineker (Barcelona, 1986-89), Raphael Meade (Real Betis, 1987-88), Sammy Lee (Osasuna, 1987-89), Adrian Heath (Espanyol, 1988-89), Dalian Atkinson (Real Sociedad, 1990-91), Kevin Richardson (Real Sociedad, 1990-91), Vinny Samways (Las Palmas 1996-2002 & Sevilla 2002-03), Mark Draper (Rayo Vallecano, 1999-00), Steve McManaman (Real Madrid, 1999-03), Stan Collymore (Real Oviedo, 2000-01), David Beckham (Real Madrid, 2003-07), Michael Owen (2004-05), Jonathan Woodgate (Real Madrid, 2005-06), Jermaine Pennant (Real Zaragoza, 2009-10). "It would have been amazing to face Barcelona and a great game to be involved in," I'Anson, who will instead continue his footballing education with a season-opener at Albacete, told BBC Sport. "But moving to Alcorcon gives me a chance to get some first-team games under my belt. It's a shame I won't be at Elche this season. I could have stayed and trained with the first team. "I think Fran Escriba, the manager, would have liked it if I had stayed in case he needed to use me. But this loan move will give me lots of minutes on the pitch. I want to use that to my advantage." I'Anson's rapid rise from the fifth division of football in England to a contract in Spain's top tier is a remarkable tale of perseverance. "I have to pinch myself sometimes," I'Anson added. "I grew up admiring the likes of Cristiano Ronaldo, Messi and Luis Suarez. Now I could be marking them in the future." The life-long Tottenham fan arrived in Spain, along with older brother Alfie, from London at the age of seven. His mother, Kay, and father, Dean, decided to make a fresh start in Malaga after falling in love with the area on their holidays. Within a year both brothers were speaking perfect Spanish and playing in the same junior team, Atletico Benamiel, as Isco, Real Madrid's Champions League-winning midfielder. "My football development was in Spain," said I'Anson. "They taught us always to play out from the back, even if you lost the ball and the other team scored. All I remember thinking was 'why do we keep doing this?' because the other side just kept on scoring. We were going home crying." I'Anson was 15 when he got the break that would change his life. Spotted by a Forest scout playing in a tournament in Malaga, he was invited back to England for a trial. "They offered me a youth contract and said I'd be a back-up," he added. "Then they told me about Grimsby. "I didn't want to come over from Spain just before my 16th birthday and sign as a fourth choice so I took the Grimsby option." Life on the edge of the Humber Estuary was not easy at first for the teenager living away from his parents for the first time. He shared a house and paid the £1.50 bus fare to take him to the Conference club's training base at Cheapside as he propelled himself from youth-team captain to the first team in rapid time. I'Anson made his senior debut aged 17 in April 2011, scoring against Mansfield Town, and played 17 league games in two years before heading back to Spain after turning down a new contract. "I don't have a bad word to say about Grimsby," I'Anson said. "While I was there I also got my Level Two coaching badge. I still keep track of how Grimsby are doing. "I was following their progress against Bristol Rovers on Twitter from Spain on the opening day of their season. "Yes, it was a gamble to leave Grimsby because I didn't have anything lined up. I had the option of another 12 months in my pocket. It was a nervous time trying to get fixed up with another club. "It took weeks and months of trial games. I'd played in the fifth division in England and no-one had heard of me in Spain. "I thought I did well but no-one replied. Then I was lucky. I trained with the B team at Elche, Elche Ilicitano, and the manager liked me." I'Anson, who has now swapped the bus for a Mini Cooper S to travel to training, has not looked back. 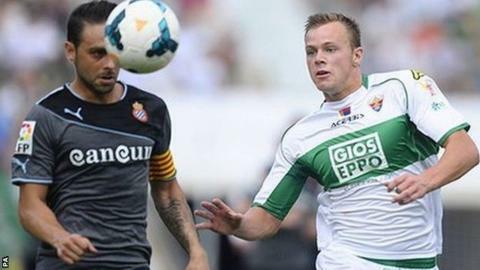 Having captained Elche reserves to promotion in 2012-13, his big breakthrough came last October when he was handed his first-team debut in a 2-1 win over Espanyol. Another start followed five months later against Granada. His next appearance for Elche will be a while longer, but I'Anson is determined to cement a first-team spot on his return to the club's Estadio Manuel Martinez Valero next May. He is still forging a successful career in Spain, and echoes the view of former England left-back Ashley Cole, who recently joined Roma after leaving Chelsea, that English players are afraid of moving to a foreign club. "It is easy to stay at home and play," said I'Anson. "It's the same language, it's comfortable and some just don't fancy the risk, but they definitely should." Belgian businessman Roland Duchatelet, who bought Charlton Athletic in January, is majority shareholder at Alcorcon. Their biggest claim to fame is knocking Real Madrid, then managed by Manuel Pellegrini, out of the Copa del Rey in November 2009. Alcorcon finished ninth in the 22-team Segunda Division in 2013-14. Their squad includes forward David Rodriguez, who scored one goal in 11 league outings for Brighton in 2013-14. Former Liverpool defender Dani Pacheco played for Alcorcon last season but has since joined Segunda rivals Real Betis. I'Anson's move to Alcorcon has left him with at least one problem to solve - finding a bar that shows Tottenham matches. "I'm a huge fan. My dad used to take me to matches at White Hart Lane and I was Ledley King's number one fan," he said. Being based in Madrid for the next nine months will at least allow him to renew acquaintances with his old friend Isco, who joined Real Madrid from Malaga for a reported fee of £23m last summer. "I'll be ringing him up to go and watch a few Real Madrid games," I'Anson added. Next season, if all goes to plan, the 2012 Lincolnshire Cup winner plans to be facing his boyhood friend on the Bernabeu pitch. How do Real Madrid keep £500m of talent happy? Read more on Ronaldo, Rodriguez, Bale: Can Real Madrid keep them all happy?